Chi-Chi (Diany Rodriguez), Ben (Jimmy Kieffer), Bechet (Antwayn Hopper) and Claudine (Shakirah Demesier) all met in Paris during the Second World War and bonded over a love of jazz music and gumbo made by their friend Nick (Cordell Cole). They decided to stay in Paris for a little while after the war, and sang at Le Mars Club, which was an actual desegregated jazz club in Paris in the 1950s. It was Nick’s dream to open an integrated jazz club in the US, but the blitzkrieg took him before that dream could be realized. After Nick’s death, the group takes the dream across the pond to the “city too busy to hate,” teams up with a savvy real estate investor, Harold (Robin Bloodworth), and starts performing to sold-out crowds. They even attract the attention of a record executive (Daniel Triandiflou). When racism turns violent and opportunity starts to conflict with the dream, however, they must decide whether Nick’s Flamingo Grill can go on. The Alliance Theatre is staging Phillip DePoy’s world premiere musical play Nick’s Flamingo Grill on the Hertz Stage through October 28. The play marks the Alliance’s return to the Woodruff Arts Center for their 50th anniversary following an off-campus season. 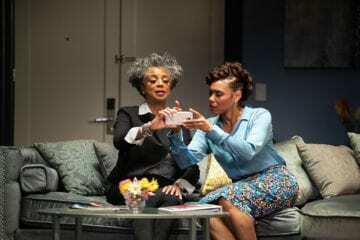 Tinashe Kajese Bolden, who last appeared in the Alliance productions of Hospice and Pointing at the Moon, directs a quick and dirty measure with a talented cast. Her handling of the staging, which features the audience on opposite sides with the stage in the middle, serves the text well. She and set designer Kristen Robinson immerse the audience in the world of the club from the moment they hand over their tickets. Upon entering the theater, there are show bills and posters plastered on the walls, and walking through the doors, the sound of chatter and jazz piano fills the space. If there’s any gripe with Kajese-Bolden’s direction, it’s that the French and Cajun accents are meh and the stylistic handling of the shootings and the bombings takes away from the authentic intensity of the characters’ reactions to the events. 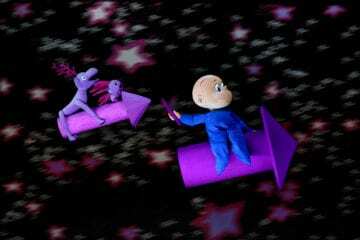 The overuse of slow motion and strobe lights to address those parts of the script could be tightened up a bit. Diany Rodriguez puts in a star turn as the jazz singer Chi-Chi. That said, the cast is quite good. 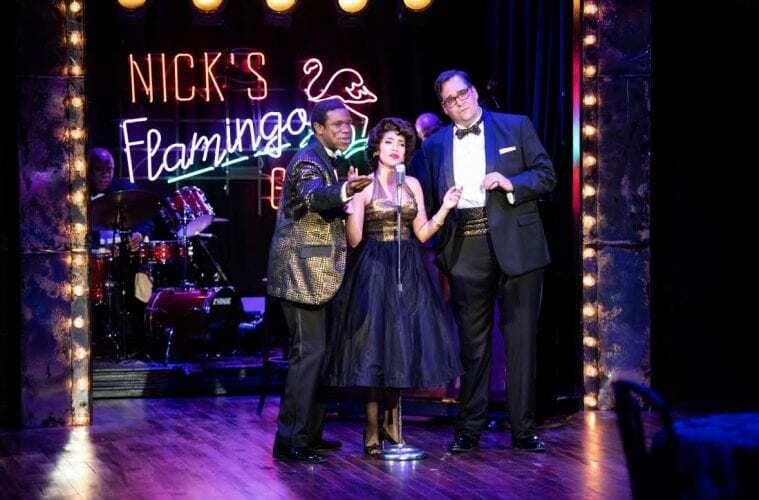 Rodriguez as Chi-Chi is in rare form as the quick-witted, boisterous jazz singer in what could be a career-defining role next to her performance in Between Riverside and Crazy at True Colors Theatre. She is channeling the spirits of the great jazz divas in this role, and even though it doesn’t seem like jazz is familiar to her tongue, she serves it. Hopper, whose voice is to die for, is a delight to watch as he moves like water and talks like red wine as Bechet. Bloodworth as Harold has great comedic timing and balances it with sincerity to tell the story of a gay man who knows he will not be able to live his truth in his lifetime. DePoy’s script is loosely based on the story of a 1950s jazz club that was once located in what is now the Castleberry Hill neighborhood. His musician father once played there, and in writing the script, he interviewed his father along with other musicians in town who knew about the place. Today, their memories are the only evidence that the place existed, but in this new 90-minute show, DePoy manages to revive the unifying power of jazz. 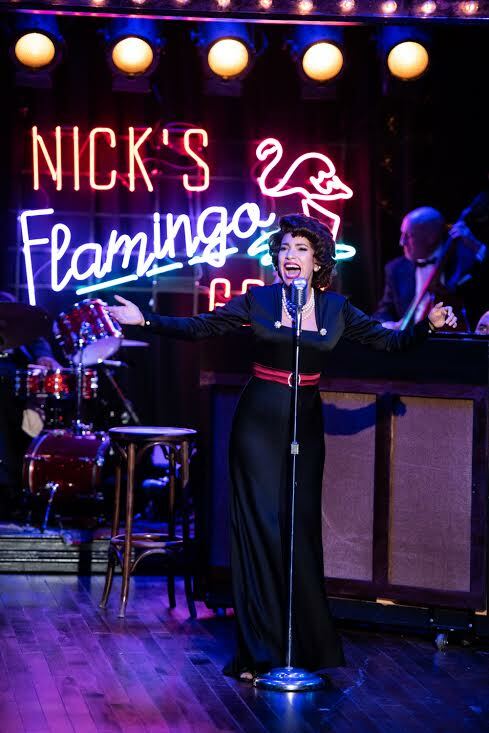 Nick’s Flamingo Grill works well with the Alliance Theatre’s affinity for musicals about jazz musicians who’ve almost had it all but are stopped by misogyny, homophobia, racism, fascism and other -isms. (See Harmony and Ethel.) Nick’s Flamingo Grill transports the audience back to a time when a “colored only” water fountain was a civil rights achievement (better than the horse trough) and when jazz emerged as a bridge-building art form. The show feels surprisingly current, not meandering in nostalgia, but serving as a reminder that unity is possible. The band is flawless under the direction of Tyrone Jackson, who composed “Native Guard,” and his jazz piano is the play’s seventh character. When the trio sings “3 a.m.” and “Three Part Harmony,” it’s hard not to scream out, “Keep going!” Kudos are also in order for the bustling city soundscape designed by Joshua Horvath and for Lex Liang’s perfectly put together costumes. The trio’s gold and black show outfits and Chi-Chi’s red trumpet skirt with matching fedora are fabulous. No matter how great they look, though, music can’t shield these characters from racism. Chi-Chi and Nick can’t get their daughter enrolled in school, the club has been shot at and been on the wrong side of a Molotov cocktail and Claudine studied at Le Cordon Bleu but is essentially the club waitress. At one point in the play, Ben says to Harold that he’ll have a “better chance with the entire nation of France than with the Baptists” in convincing them that segregation is wrong. Still, DePoy’s message is that if we did civil rights once, we can do it again. Everyone could use a night at Nick’s Flamingo Grill.